In the United States, Santa Claus, the jolly bearer of gifts with a long white beard, has been around in the familiar form we know today since roughly the 1823 publication of the poem A Visit From St. Nicholas. Many others have contributed to Santa’s enduring myth in the U.S., including illustrator Thomas Nast, and writer L. Frank Baum of The Wonderful Wizard of Oz fame. By the mid-century, the popular image of Santa Claus was solidified enough in the American consciousness that even Coca-Cola® was using him for Christmas advertising campaigns. 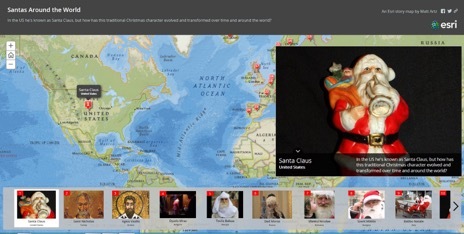 St. Nicholas, the 4th century Greek patron saint of children who eventually took on the Anglo Saxon guise of Father Christmas, has evolved in a myriad of ways in different parts of the world. Even countries as far removed from Western cultural tradition as Japan have adopted and recreated their own versions of Jolly old Saint Nick. 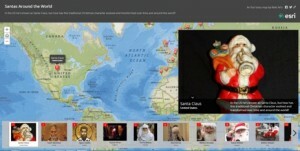 On this special Esri Story Map for the holiday season, see the different forms Santa Claus takes in various cultures mapped around the world. In the United Kingdom, “Father Christmas,” who is very similar to the modern American Santa Claus, rides a white horse, or sometimes even a goat, instead of reindeer. In Iceland, instead of a single Santa Claus, children are visited by 13 trolls or “Yulemen,” who bring them presents on Christmas. And in China, Shengden Laoren, or “The Old Man of Christmas,” has adopted all the characteristics of the modern American Santa Claus with one unique addition—he plays a saxophone.